They would think she was too stupid and too ignorant to matter. Her kind are just that way. That’s why it didn’t offend their white, Christian nature to own black slaves. 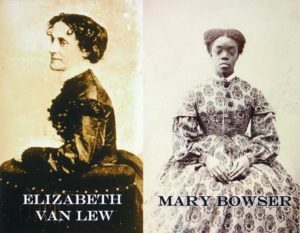 The young female slave, Mary Bowser, owned by Elizabeth Van Lew in Richmond, Va., the headquarters of the Confederacy, knew all of that to be true, and she would use their thinking to defeat them. 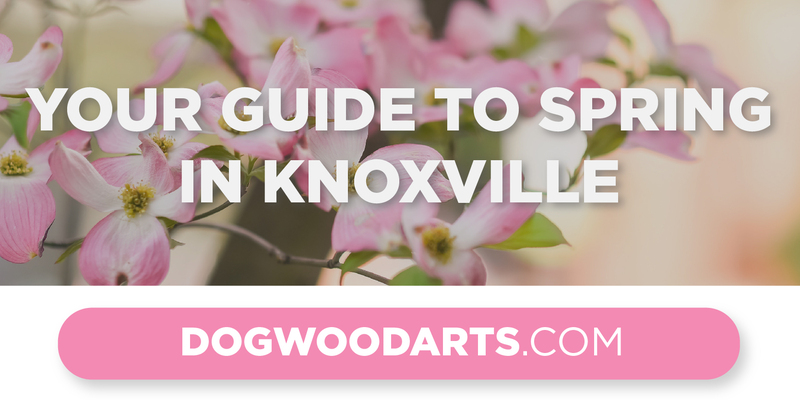 That’s the true story behind Knoxville composer Jesse Ayers’ very well crafted, short, one-act opera “Beneath Suspicion,” which just finished its run in Marble City Opera’s production at Blount Mansion in downtown Knoxville. 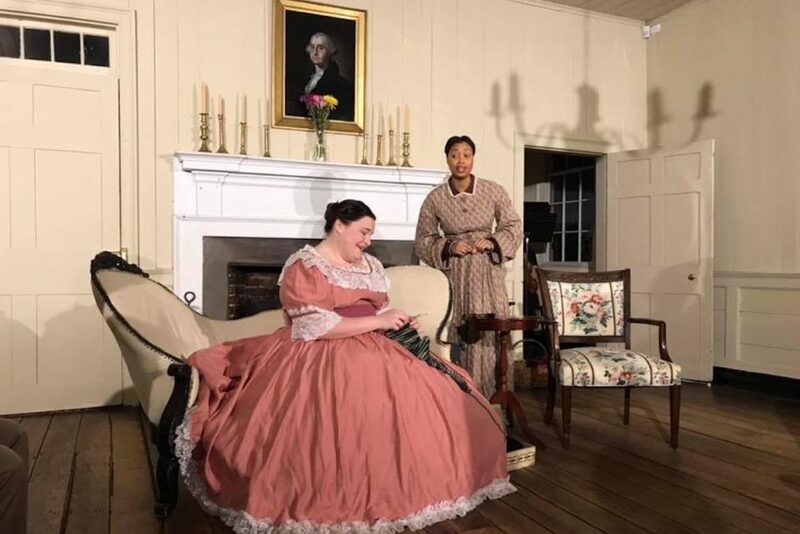 Sopranos Denisha Pompey, who played Mary, and Lindsey Fuson, as Bet (Elizabeth), sang their hearts out until tears filled their eyes and flowed from the tear ducts of just about everyone crowded into the parlor to hear their story unfold in their wonderfully delivered soprano duet. 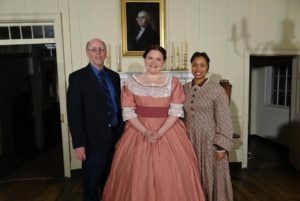 George Washington looked down from above the mantel behind them as the story of Bet and Mary unfolded. After Bet’s father died, Bet gave Mary her freedom and sent her to a Quaker school in Philadelphia, realizing how smart Mary was and that she would benefit from an education. But to Bet’s dismay, Mary came back. “Freedom was right strange at first,” Pompey’s Mary sang. “I was born a slave. My mama was born a slave. Her mama was a slave. Then your daddy took sick, an’ he die,” she sang as Ayers’ dark harmonies rose and fell in Brandon Coffer’s superbly played piano accompaniment. Written in cycles and circles of sevenths that flowed, took a break for important unaccompanied moments, then turned back on themselves, the music underpinned Mary as she later sang, “An’ you live your lives servin’ out a great cause. An’ that cause is what make you really free. I learnt that freedom’s got no sweetness ’less it be used for somethin’ bigger than me,” laying out her plan to go back into slavery. She would find a place in the neighboring house of Confederate President Jefferson Davis, who, Mary had been told, leaves his papers scattered all over his desk. She would read his papers and report to Bet who would pass the information on to the Union in Washington. 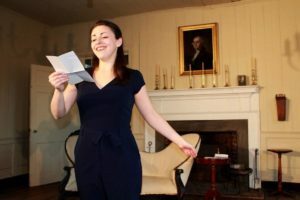 “Beneath Suspicion” was the closer on Marble City’s double bill, which began with Alan Louis Smith’s song cycle “Letters From George to Evelyn,” performed here by Marble City for the first time as a staged production. It’s based on real letters written by British First Lt. George W. Honts to his wife, Evelyn, in the early years of World War II when Honts was sent to the Continent. Gorgeously sung by soprano Elena Stabile, accompanied by Coffer, the letters celebrate both the quiet joys and delights of ordinary days and memories of being together. Evelyn slumped to the floor, right at the feet of the audience who had gone on this emotional journey with her. Information about Marble City’s next opera, “Suor Angelica,” to be performed in the courtyard of St. John’s Cathedral downtown May 30-31 and June 1, along with tickets, can be found here. Marble City Opera is making waves in the opera world. Don’t miss going along for the ride.